San Francisco’s No Starch Press has found success producing “sharable books for geeks,” eschewing DRM and defying conventional publishing wisdom. “We have never used DRM and we never will. It’s just foolish,” says Bill Pollock, founder and official “Big Fish” of No Starch Press, a small San Francisco publisher. DRM, or Digital Rights Management, is the technology used by publishers and other copyright holders in their attempt to control how digital content and devices such as ebooks are used after they are sold. 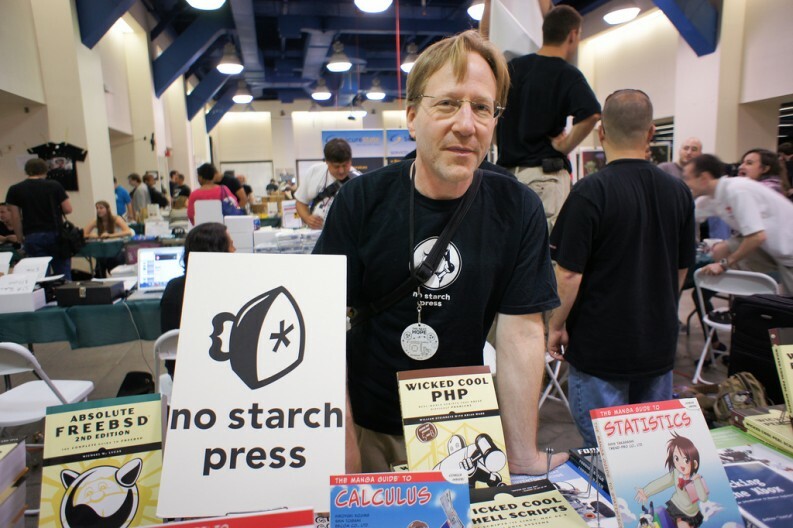 No Starch Press, which publishes books for geeks on a range of tech-related subjects from hacking to programming for kids, plus lots and lots of books about Lego, has taken a principled stand against DRM and many of the other features of contemporary publishing. He has come up with the radical idea that “you have to trust your readers, and when you show that you trust them they will respond to you,” and so when you buy a physical book from No Starch Press you are given the ebook free to use how you want to. 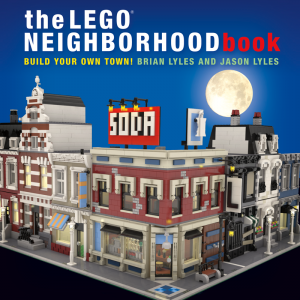 And this approach seems to be paying off: No Starch Press’s new LEGO Neighborhood Book sold 15,000 copies in two weeks and had to be reprinted. They usually publish twenty of their good-looking books every year, (many of which look like a work of art), but published nearly 30 titles in 2014. In contrast, pirate sites are, he says, “no real competition” with books typically downloaded only a few hundred times. In fact, he often argues that piracy may help build a buzz about new books. Bill Pollock’s first intense job may have been as a busboy while studying at Amherst College in Massachusetts (he claims to excel at carrying lots of plates at once), but he is now very much an industry veteran. Yet despite spending twenty-seven years working in publishing for big names like Springer Verlag and Osborne/McGraw-Hill, he appears every inch the revolutionary, with his black T-shirt, Lenin-esque glasses and intense stare as well as the passion and determination that seem embedded in the way he pronounces every sentence; personality traits which are very much needed to challenge publishing orthodoxy. No Starch Press, which Pollock founded in 1994, publishes beautiful-looking and well-written “books for geeks” (many of whom might be classified as hackers) for as much as $100 a book. But when you buy a No Starch book you can log on to an online account and download – and share – the digital version as many times as you want. The seminal Hacking: The Art of Exploitation (second edition, 2008) sells “in the many tens of thousands” at almost $50 a go. Not that this book is the hacking equivalent of the infamous counterculture bomb-making manual, The Anarchist Cookbook, (for that, turn to his Steal This Computer Book). Instead it is designed to show hackers of all stripes how hacking attacks happen and how to find new exploits. Pollock wants to make his readers smarter, not as he says “more annoying”. Key to this kind of success, says Pollock, is that “quality wins,” and for No Starch Press this means letting “editors edit” and having ten out of 18 of his staff involved in editorial. “Unfortunately, many publishers have been reducing their editorial staff while increasing their level of publication as if they are trying to compete with Amazon’s CreateSpace. It’s a bit like drowning, you paddle faster and faster, and you drown even faster. We talk about publishing fewer, better books. Pollock himself attends at least ten hacking conferences a year, including Defcon in the US and Chaos in Germany, where he spends time talking to his readers and trying to get ahead of the curve. Too often, he argues, publishers just make a product, stick a price on it, and hope it sells. He has found that so successful is No Starch at anticipating demand that “many publishers just copy what we do.” Now, Pollock says, “I often head in the opposite direction. I don’t want to copy-cat anyone, I want to be first. If I can create a new market so much the better.” Although, he concedes, following up on break through books can be challenging. Coding for children is another category that No Starch dominates and the competition is rushing in. It’s hard not to pay attention when books like Python for Kids and Super Scratch Programming Adventure! lead the market and sell in the tens of thousands. “Minecraft books have so far been the one that got away,” with conversations that Pollock had years ago with Minecraft going nowhere. It is a label that he believes could be attached to many of the founding fathers of Silicon Valley including Steve Jobs and Steve Wozniack and, further back in history, the likes of Alan Turing or Ada Lovelace. And while Pollock believes the anarchism that hackers such as the Anonymous group advocate (and which influenced even the design of the Internet itself) is probably wrongheaded, “its values do resonate with me” when dealing with issues that digital technology throws up – like DRM. Hacking and the printed book may not fit easily together in many people’s minds, but Pollock argues that hackers have an “academic mentality and they love to learn, and when people love to learn they are deeply into books. “I try to explain approach to traditional publishers, but they just don’t understand it. 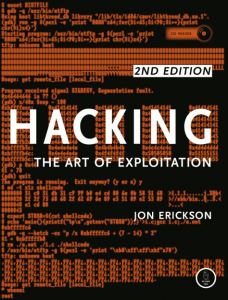 Hacking: The Art of Exploitation, 2nd Ed.